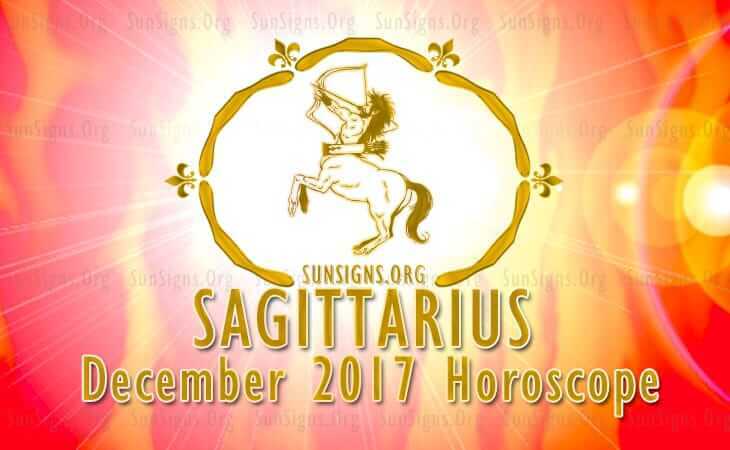 Sagittarius December 2017 Horoscope foretells that planetary strength exists in the Southern half of the horoscope this month. The House of Family is very robust while the House of Career is very weak. Naturally domestic happiness and emotional equilibrium are more essential than career development in December 2017 for the Sagittarius zodiac. You can direct your energies to enhance happiness in the family and work on your career with the right frame of mind. The December 2017 horoscope predicts that planetary power is located in the Eastern sector of the chart and the House of Self is dominant. At the same time the House of Others is blank for the Archers. You have the liberty to make your life on your own terms. You are not bound by others and are not seeking their help. There is no need for the Sagittarius personality to adapt to situations or people. Design your own heaven and enjoy. Spirituality and religion will interest the Sagittarius in December 2017 due to the influence of Jupiter. You will form your own opinion about spirituality in days to come after the Mercury Retrograde 2017. The 2017 astrology predictions forecast that in spite of preoccupation with family affairs, professional prospects are good for the Sagittarius zodiac sign. Career growth will be excellent in December 2017. The 2017 monthly horoscope predicts that the Sagittarius monetary affairs will be in the spotlight this month. You have all the confidence and strength to accomplish your financial targets after crossing over the obstacles on the way. Your professional expertise and emotional strength will help you to become prosperous. Your friends will support you to achieve the fiscal targets easily. Sagittarius earnings can be boosted through overseas projects, probably with the help of foreigners in December 2017. December 2017 is a good time for love and romance in a Sagittarius compatible relationship. You are able to attract romantic partners with your charm. You have plenty of opportunities to get into love relationships. However you will be vacillating and are unable to decide on the fate of the partnerships. Read about dating a Sagittarius. Problems in present Sagittarius relationships will be resolved by the end of first week of December 2017. After that it is a smooth ride for love and love partnerships. This is when you should plan for a child. The Sagittarius health will be fantastic in December 2017 and can be improved further through good exercise routines. Planetary aspects are wonderful for enjoying sexual pleasures this month. You will have an enjoyable month with lot of vitality and passion in your life. The December 2017 Sagittarius horoscope predicts a passionate month but your professional commitments will take a back seat.